I come to the point that calling my stretch marks as the sign of a love marks. Love as it is the signs that I'm bearing the most precious gift I will soon be having, a child. 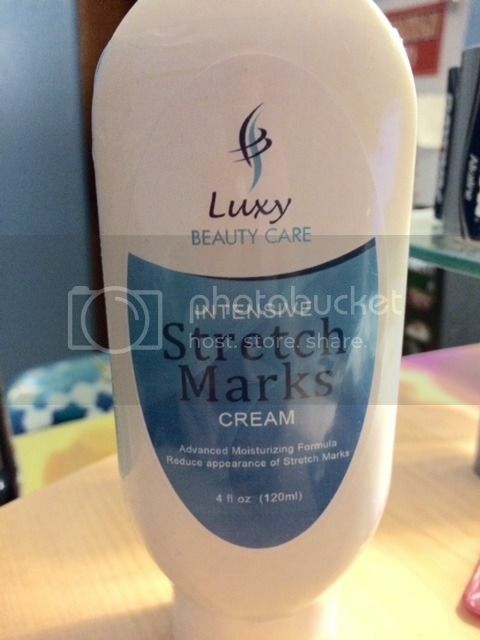 I have the chance to review Luxy Beauty Care's Stretch mark cream. This is perfect since I had a baby 3 months ago and I have noticed that I do have more love marks around my lower abdomen area. Because they are still fresh, getting rid of the marks would not be hard to reduce it. I received the product in the mail through the USPS. I don't notice any signs of damage due to the shipment and happy that I'll be able to use the product right away. It is sealed and so I'm confident that I have a brand new product. When I opened the product, one thing I notice is its smell. I don't like a strong odor into the cream I'm using as I don't want my baby to inhale it while I am nursing. I don't think the fragrance is strong, so that's a bonus. The cream isn't greasy another thing that I've been looking as I don't like to feel oily at all. The application is very simple. The Cream can be applied directly to the abdominals, hips, thighs, arms and gluts where stretch mark is present. Just have to massage it in a circular motion until absorbed. It might take at least weeks to get a better result, however, I'm thankful that there are ways to reduce these love marks I have. I would feel confident again.